Over the weekend, myself and 12 others will be travelling north via Ottawa and Iqaluit to Resolute Bay. Our destination is the Haughton impact structure, which lies on western Devon Island, north of the infamous Northwest Passage. At 75 degrees North, Haughton is the highest latitude impact structure on Earth. 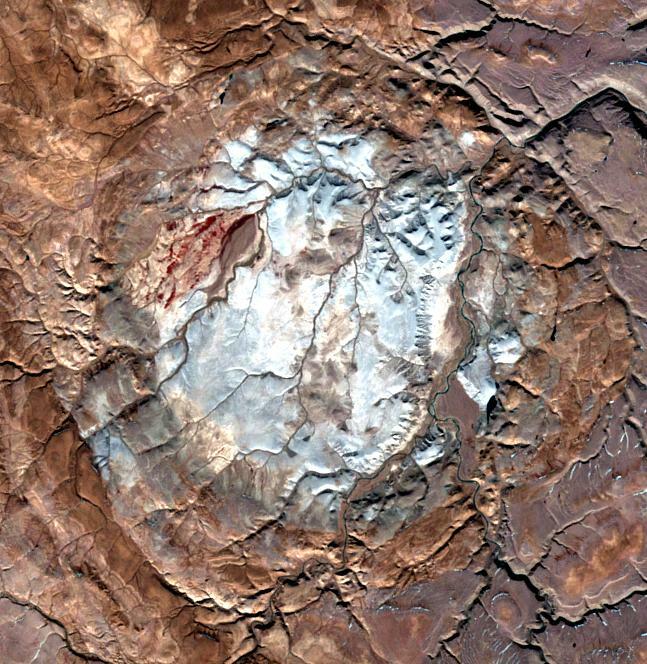 Haughton is a unique crater: at 23 km diameter and 24 million years old, it is large, relatively young, and lies in a polar desert environment. In addition to all the impact-related geology and astrobiology science that can be done, the crater and its surroundings display a multitude of landforms that are common on Mars: gullies, polygons, scalloped depressions, and intriguing channels. The question is: do these analogue landforms on Mars form in the same way and under the same conditions to the ones we see on Devon Island. The answer is we don’t know yet, which is why we must venture north! 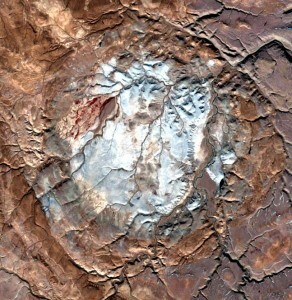 A Landsat7 image of the Haughton impact structure. The pale grey rocks in the interior are impact melt rocks – essentially the solidified remains of a pool of melt from the melting of many cubic kilometres of target rock during the impact event. – Dr. Catherine Neish, post-doc Mike Zanetti, MSc student Elise Harrington (University of Western Ontario), who are developing tools and techniques to enable the application of RADARSAT-2 polarimetric Synthetic Aperture Radar (SAR) and other satellite data for geological mapping and resource exploration in the Canadian Arctic. – Dr. Mark Jellinek and PhD student Anna Grau (University of British Columbia), who are studying the morphological and morphometric characteristics of channels on Devon Island as analogues for similar Martian landforms. – Jen Newman (University of Western Ontario), PhD student, who is investigating various impact-generated breccias and melt rocks. – Dr. Etienne Godin, a new post-doc at the University of Western Ontario, who is focused on the study of various periglacial landforms, including polygons, thaw slumps, and gullies. – Dr. Alexandra Pontefract (MIT), working on the astrobiological aspects of the crater and gullies both within the crater and in the surrounding terrains. – Dr. Bethany Ehlmann and post-doc Dr. Rebecca Greenberger (Caltech/JPL), who will be using a hyperspectral camera to study various formations within the crater. – Dr. Antero Kukko from the Finnish Geospatial Research Institute, who brings with him portable lidar technology that just about everyone on the team will use. Managing everything in the field is Shamus Duff, my field logistics coordinator! Joining the team later in July are Dr. Livio Tornabene and PhD student Byung-Hun Choe from Western and Dr. Chris Carr from MIT. Follow my Twitter feed for details from the field.